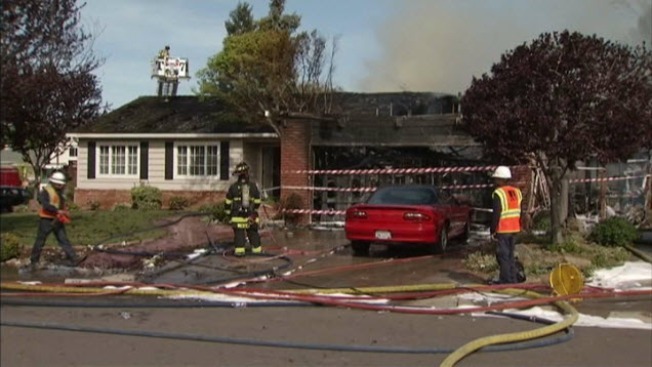 A two-alarm blaze displaced residents and damaged a pair of homes in Mountain View on Wednesday. Firefighters have extinguished a two-alarm fire that damaged two Mountain View homes and displaced at least two people Wednesday afternoon, a fire spokeswoman said. The fire was reported around 2:45 p.m. at two neighboring homes in the 100 block of Wortham Court, according to Mountain View fire spokeswoman Jaime Garrett. The fire started in one house and spread to a neighboring home, causing major damage to the first house and moderate damage to the second, Garrett said. People were inside both homes when the fire broke out but all were able to evacuate safely by the time fire crews arrived on the scene, she said. The fire displaced at least two residents, the spokeswoman said. Garrett said she did not know how long it took to get the blaze under control, but crews remained on the scene checking for hot spots as of 5 p.m.
An investigator was on the scene working to determine what caused the fire.